This morning I made a quick run to Walmart because I wanted to get two white boards and dry erase marker pens for the kids. Kathy suggested using these little white boards for the kids to practice their writing on. Then I headed for the electronics section. 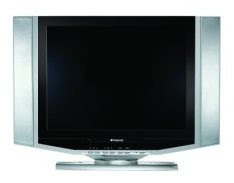 I've been thinking about getting a small flat panel TV, one that I can put next to my flat screen computer monitor. How's that for multi-tasking? I saw a 15" HD LCD flat screen Polaroid for under $250 and the 19" HD LCD flat screen Polaroid for almost $300. Unfortunately they were out of the items. I was told to check back in a few days, to see if their new stock has arrived. Finally, I headed for the stationary aisle. I found the white boards which came with the dry erase marker pens. I bought an extra set of markers and also a set of eraser, and dry erase colored markers. This evening Kathy and the kids used the new boards for the first time. The kids are really enjoying their lessons with Kathy. They look forward to seeing her every day now. waseh...cantik tv nyak :) sekumbang aku dah berblog tuk,jarang aku meda tv :P kadang2 termiss pulak cerita best. Yes, it is a neat looking tv, looks like my monitor. Don't want to miss my Dancing with the Stars lah! Pat, nya lah sampai enda ingat meda tv! Enda berasai jam, program pen udah start. Cat, they didn't suggest a rain check, so I didn't think to do it. I hope when the new stock arrives, they won't be sold out on the same day!